(Warning: there’s a photo-heavy post ahead! I couldn’t stop snapping away at all the gorgeous displays). Every time spring rolls around in Barcelona, I feel like I’m a whole new person, much lighter and happier. After the chilly winter, it’s a huge relief to feel the sunshine again as I walk through the city streets. The terrace bars and restaurants start to fill up with people happily enjoying a few after work snacks. 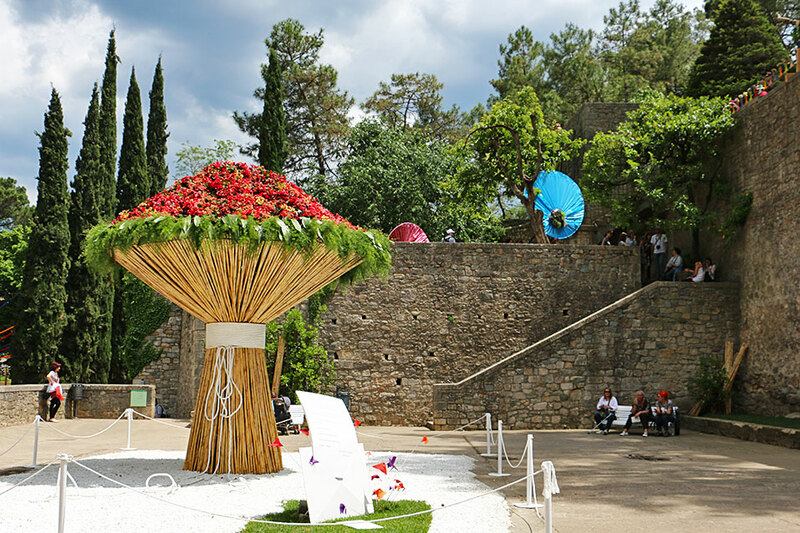 But there’s one extra-special event that goes on in the spring that’s my favorite way to celebrate the arrival of the warm weather – the Temps de Flors flower festival in Girona. Even though the city is only about an hour north of Barcelona, the festival isn’t especially well-known outside of Catalonia as far as I can tell. Spain has another flower festival that’s much more famous – the patio festival in Córdoba, down in Andalucía. Córdoba is a lovely little city, and it looks gorgeous when all the white patios are decorated with bright flowers (or, at least it does from the pictures; I’ve never been). 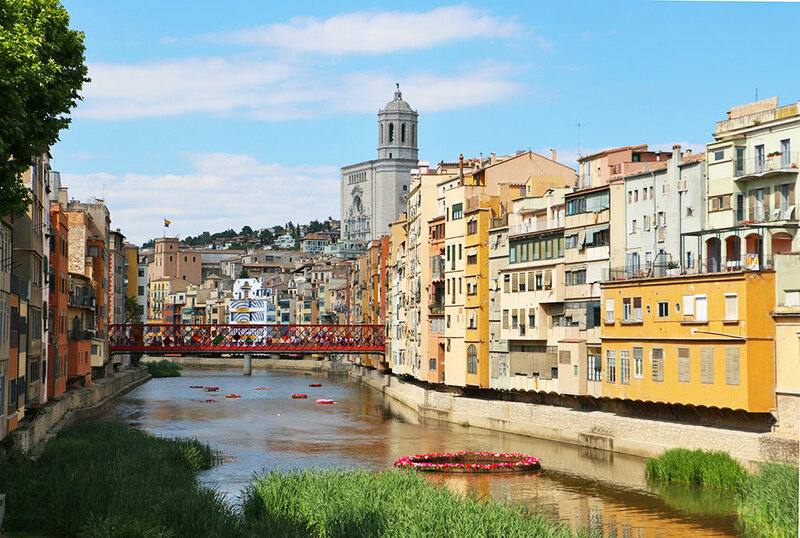 The Temps de Flors may not have the same name recognition, but if you’re visiting Barcelona in May you should absolutely consider adding a day trip to Girona to your travel plans. 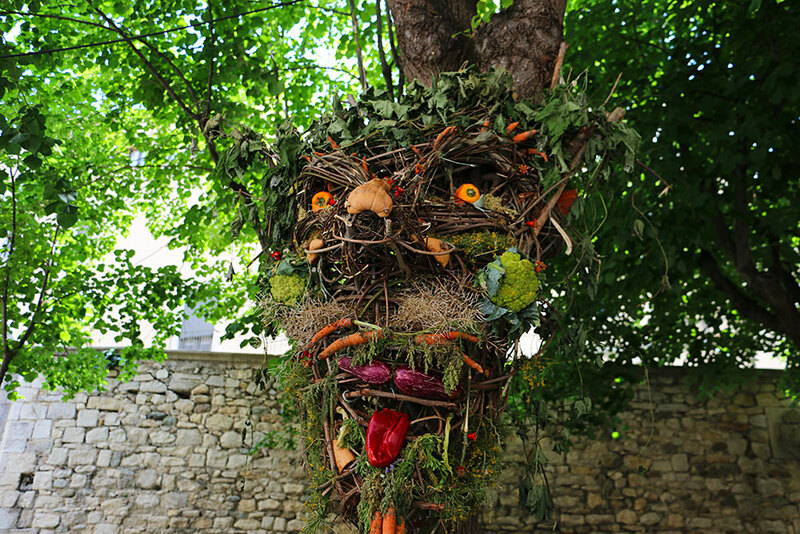 As soon as you arrive in the charming city on the Onyar river for the festival, the easiest trick to find the best displays is just to follow the footsteps of larger groups. 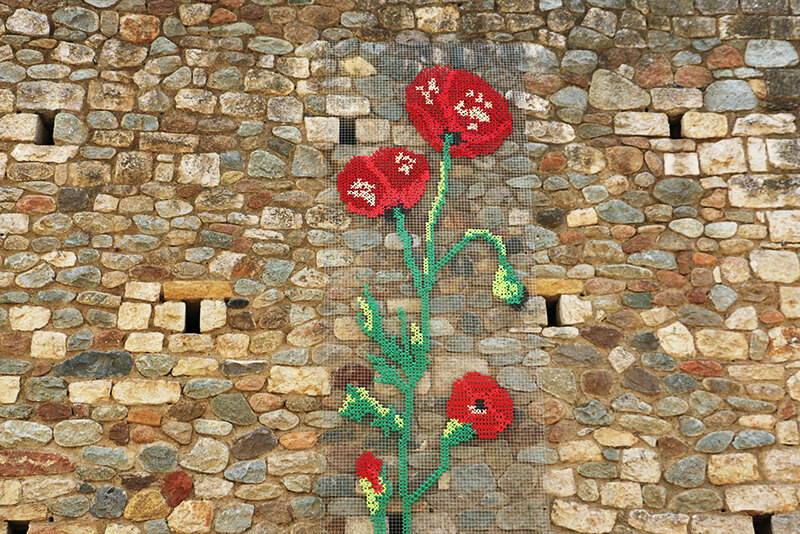 They’ll help you navigate the cobbled streets leading up through Girona’s Roman walls and find the major flower displays. Of course, getting lost when the surroundings are so nice may actually be a blessing in disguise! This year, I grabbed a free map of the festival from the train station, but then I just let my feet lead me wherever the people were. That meant I got to explore little corners of the city I hadn’t seen before. Last year, I got terribly unlucky with the weather; when I stepped off the train, it was 11°C and raining hard. The steady rain didn’t let up, and I ended up leaving the festival much earlier that I really wanted to because I was freezing cold and soaked through. This year, the weather couldn’t have been nicer. The skies were (mostly) clear and bright blue, making all the vibrant flowers really pop against the city’s soft gold and grey tones. The busiest displays are centered around the city’s most famous sights – the cathedral (above) and the Arabic Baths (below). The cathedral is particularly busy, because the square beneath it has a few bars and restaurants with coveted terrace seating.It IS a pretty spectacular view, even if the pulsating crowds coming to look at the cathedral decked out in spring flowers mean you can’t exactly relax as you have your snacks. 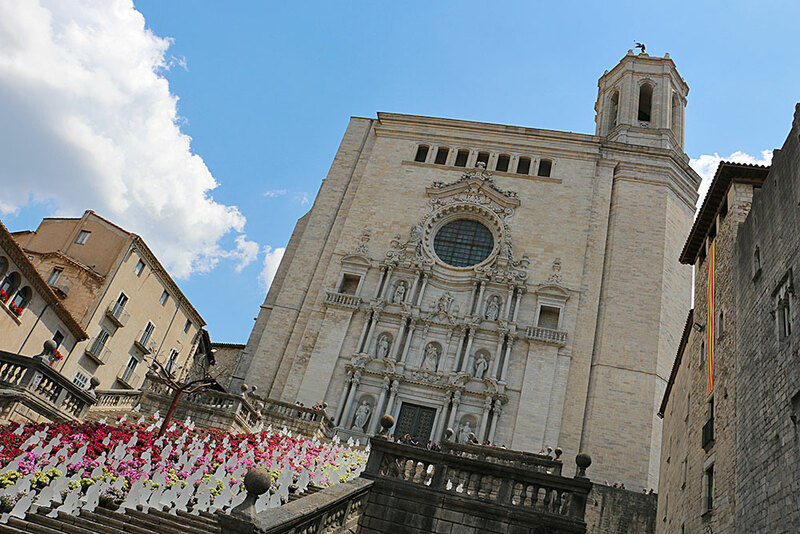 So if you’re hoping for a relaxing day out amidst the flowers, the secret is to keep walking past the cathedral, past the baths, and back to the quieter section of Girona to the north. There are big green parks and squares with lots more open space to sit back and enjoy the festival. They fill up with people having picnics, everyone from families out to a day trip to teenagers hanging out with their friends to groups of old people who look like they’ve been firm friends for about the past 70 years. 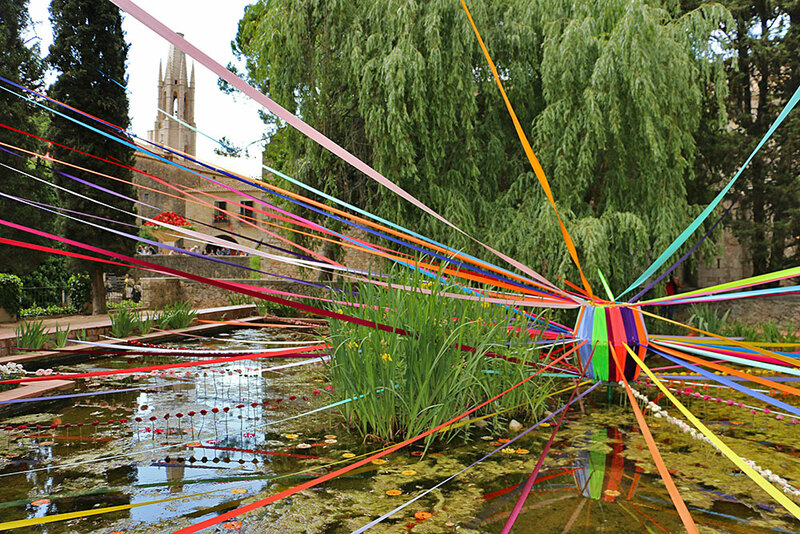 It’s not just key monuments and pretty parks that get decorated for the festival (although those are usually a safe bet for spots that will have something going on). 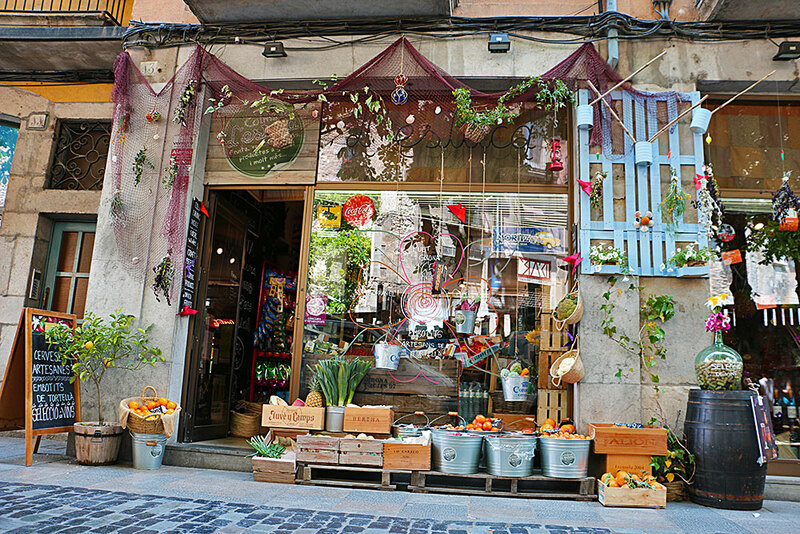 The shops and restaurants also get into the springtime spirit, and there are flowers of all sorts dotted around, whether they’re drawn on in paint or actual flowers in the windows. 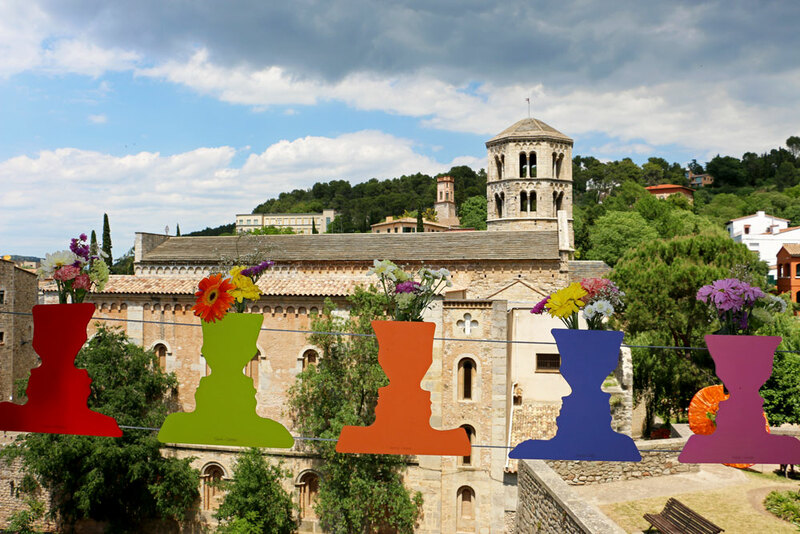 With the whole city decked out in its finest florals, Girona becomes even more beautiful. I actually didn’t realize it was a face until I got home and looked at my photos. 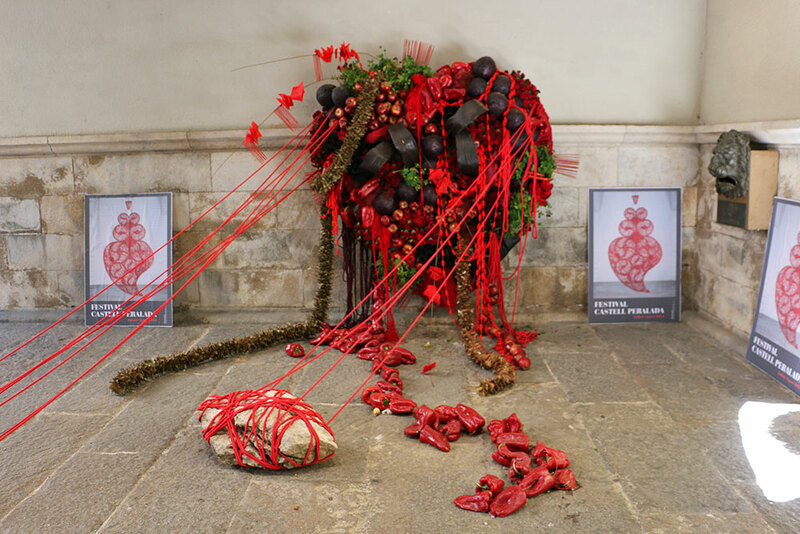 He wasn’t the only piece of creative flower work; there were also jeans stuffed with flowers at the Arabic Baths, cross-stitched flowers decorating the city’s stone walls, and a shiny red heart with lots of red peppers for color. Here are a few more of my favorite spaces from the festival. The city’s motto is “Girona m’enamora”, which roughly translates to “I fall in love with Girona”. After seeing the Temps de Flors and visiting the city a handful of times, I definitely think that the motto is an appropriate one. What kind of spring celebrations have you seen on your travels (or at home!)? This looks like a very nice place. Cool celebrations. Here, spring comes by much earlier in the year. We are in the middle of summer now. We’ve lost the original idea, but Holi is our spring festival. I’m envious, I love the summer even more than the spring! I’ve seen photos of Holi and it looks like a very beautiful festival. Maybe I’ll get there someday! Great photos, Jessica! 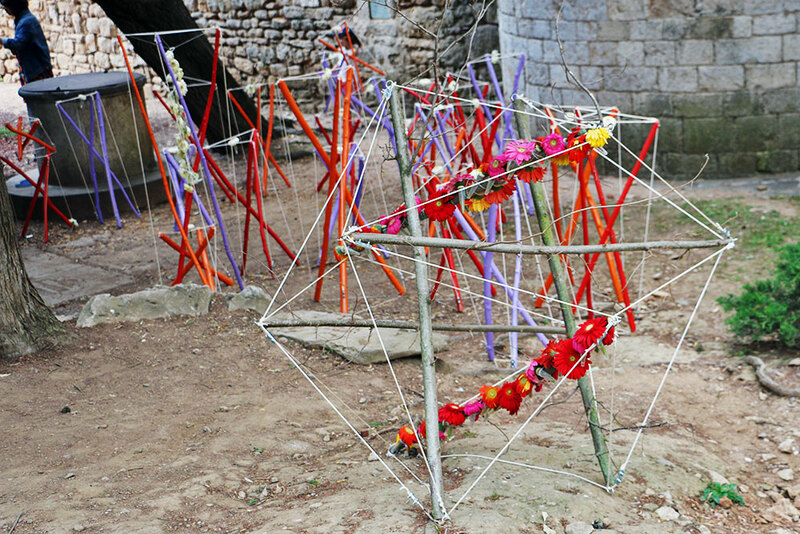 I’ve been to Girona dozens of times but have never been there for this festival. I’m definitely adding it to my list! I’m not one for fancy cuisine either, but I think you would really like la Terra for great smoothies, granizats, coffee, snacks, etc. I always stop there for a pick-me-up when I’m wandering through the Barri Vell. Also, I love “Crepdeque?”, a crepe stand a little further down the street. I am not surprised that you feel like a new person when the spring rolls around in Barcelona. It looks absolutely charming, vivid and beautiful. These colorful streets are just amazing! 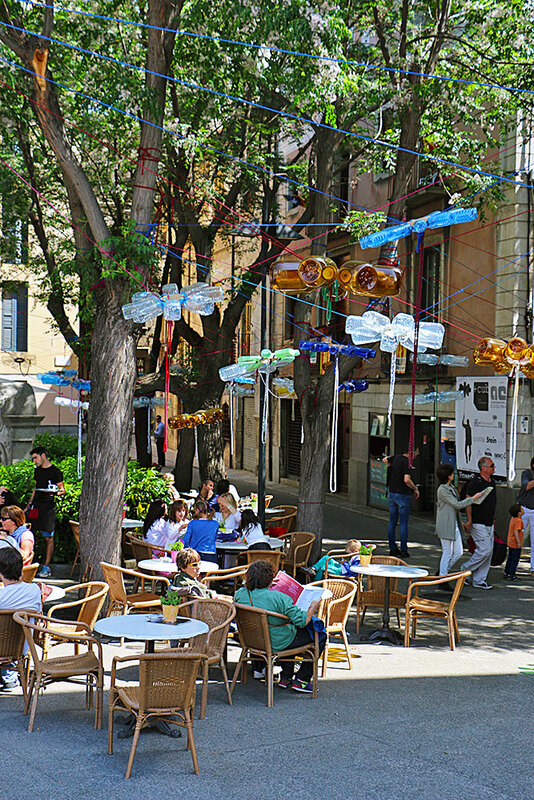 What do you like the most about spring in Barcelona? Girona is beautiful in its own right! I’d love to go…but am afraid my allergies would get the best of me! Aw yeah, if you have allergies then it’s probably not nearly as much fun! There was all kinds of flower stuff floating around in the breeze that day. 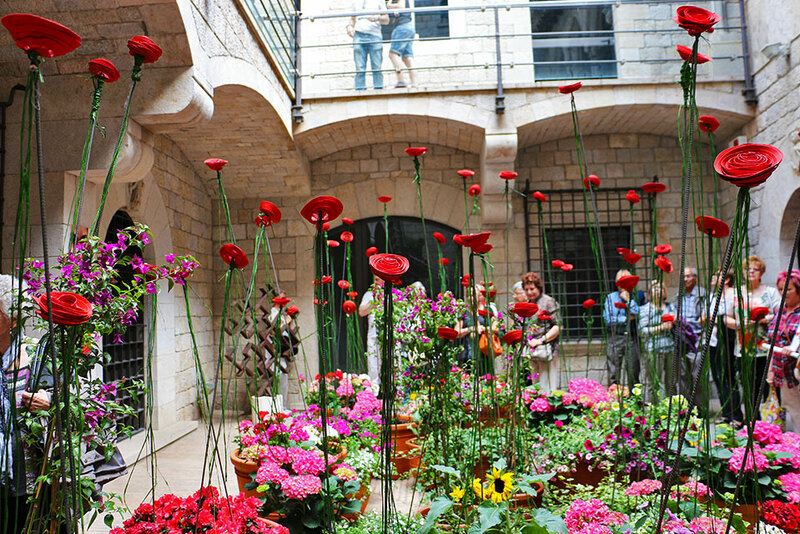 I loved Girona and would love to visit again, and this flower festival looks truly amazing. Thanks for the wonderful pictures. I’d love to see it all and, of course, try some of the food! Thanks, Sandy! I’d love to try the food too – maybe next year. Oh wow this looks like a beautiful festival! Girona has been on my list for a while now, and I’m planning on passing through next Carnaval week, so it’s a shame I’ll miss the Temps de Flors. Gorgeous photos! Thanks, Trevor. It’s still gorgeous without the flowers! It’s probably my favorite day trip from Barcelona so far. Thank you, Yovko! Girona is a really nice city to visit, flower festival or not. Wow! Gorgeous! I love visiting Girona in general, but this festival looks incredible. It reminds me a little of the patio festival in Cordoba. I will definitely try to make it next year! I think it’s kind of the same idea as the Córdoba patio festival too, although I’ve never been to that one. Either way, I’m 100% confident they’re both pretty! 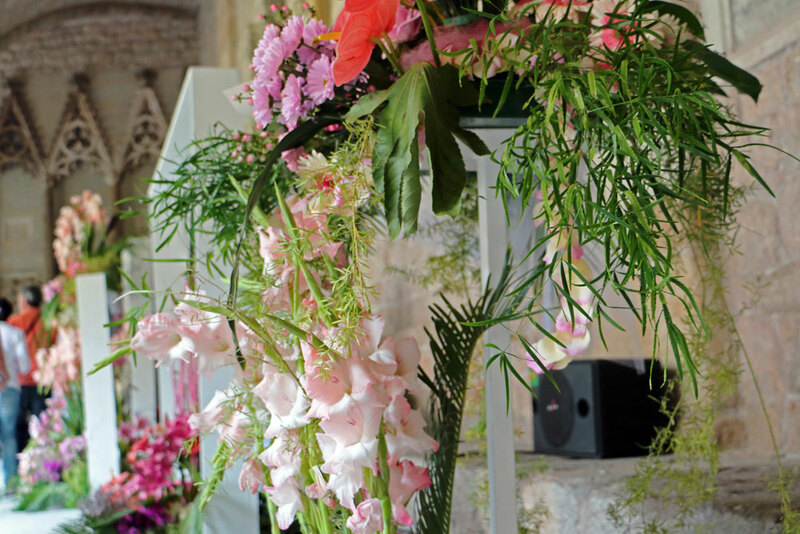 This flower fest looks like a photographer’s dream! The quirky pant planters were what really grabbed my attention, but the globe is undeniably cool, as well. Hope I can make it to Temps de Flors one of these days! It’s absolutely worth a visit at some point. Too bad it’s only a week long! That’s a good way to describe it! They get really creative with the displays. I’ve never been to Girona – but the Temps de Flors looks amazing! Thanks for sharing the link to the Cordoba Patio Festival, Jess. Beautiful! And it makes me wish I could be celebrating spring instead of going into winter here in the Southern Hemisphere (although the weather this past week has felt like spring!). I’ll have to add Girona to my bucket list. And yeah, if you’re ever in Barcelona, a visit to Girona is a nice day trip. It’s only about an hour away, and it’s a totally different vibe to Barcelona. I remembered your post about this last year and it looks like you lucked out with the weather this time around! I wish my hometown did this, a full festival month with the city just bedecked with flowers. We do have the really nice Botanical Gardens in the Bronx that periodically does events (I think there was an orchid festival recently) that I haven’t been to in ages. You may have inspired me to go back and visit them. I really did get lucky with the weather this year, especially as it’s been the rainiest, most miserable spring ever. Botanical gardens are so much fun, especially in the spring when everything is fresh and new. Girona is probably my favorite day trip from Barcelona, because you get to see a totally different city just a short train ride away. The beach towns are nice too, but you can see a beach lots of places. The art displays are my favorite, especially the pants and the cross-stitched flowers. Art displays are one of my favorite things to check out when I’m abroad. I’ll definitely put this festival on the list when I head that way. And I totally understand the whole cold/rainy thing — that happened to us while we were in Japan. It was awful. Isn’t that frustrating when you travel somewhere and just get drenched? It’s hard to pick between seeing everything and actually being warm and comfortable. I always end up cutting my trips short on rainy days because it’s so uncomfortable being soggy and walking around all day! So colorful! It looks like it was the perfect day for this, the picture of the jeans stuffed with flowers threw me off a bit when I first saw it haha. Interesting and intriguing spring decorations; I’ve never seen something as creative as this (honestly!). The colors are so vivid and accentuating! I don’t think I’ve seen people get this creative with flowers either! It’s so much fun to look at pictures of all the years and see what they came up with that year. Thanks, Alli! I’m amazed at how creative these people got. 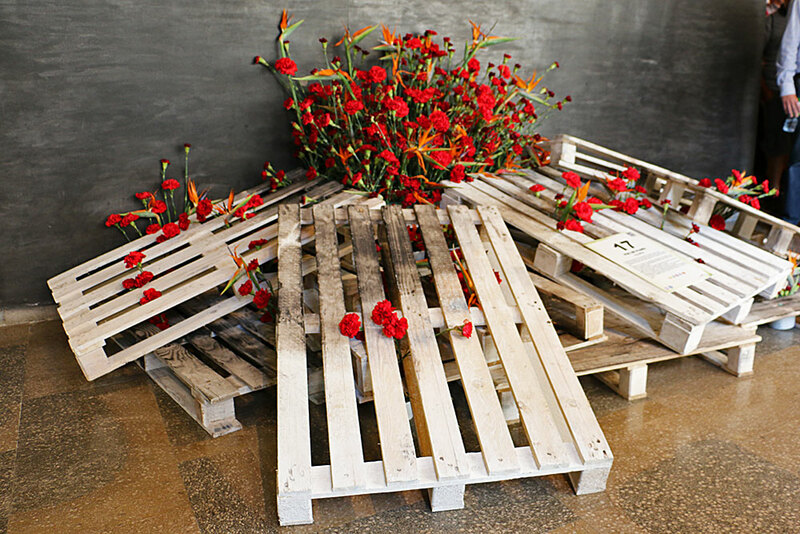 They did some incredible things with flowers! Great pictures! 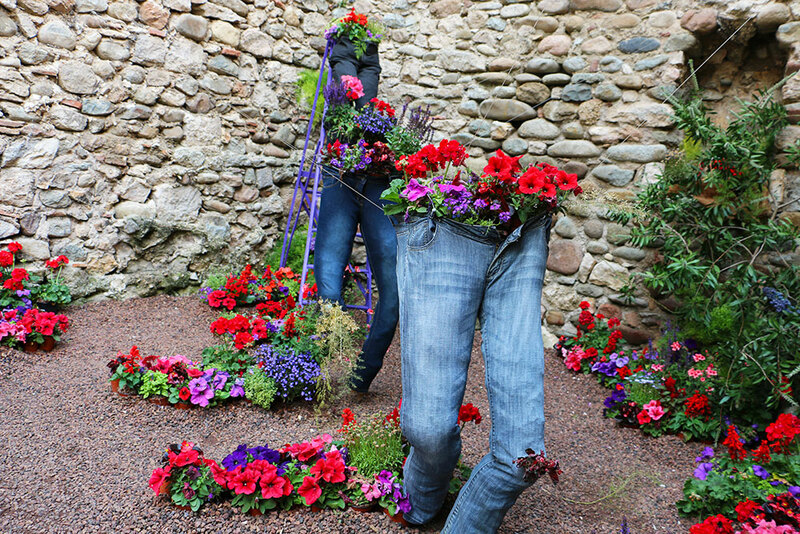 I especially love the shot of the flowers in the jeans. Beautiful photos and so colourful! The beginning of Spring is my favourite time of year. There is still some crispness in the air, the skies are blue and the flowers are beginning to bloom. We still have a few months until Spring here in Australia but I plan to head down to Canberra for the annual Floriade Festival which is all about beautiful flowering gardens. Thanks, Jen! I love spring too, although summer is my favorite. But you don’t get the gorgeous garden festivals in summer. 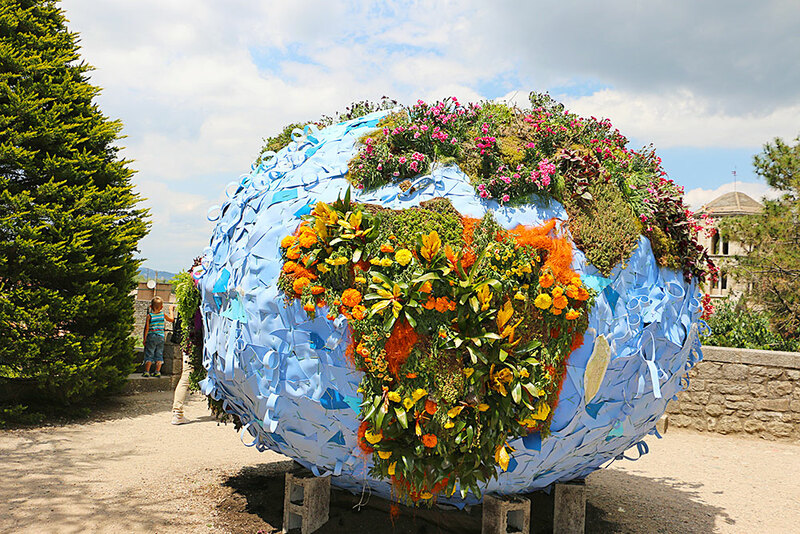 Have fun at the Floriade Festival! Whoa, I just image searched that and it looks amazing. That is some great images of flowery things there Jessica. I’ve always wanted to learn that stitching method though. I love it. I’m into that kind of 8bit design! Thanks, Ken! I bet that stitching is a whole lot easier to do normal size instead of those giant flowers. 🙂 I agree, the effect is really cool. How creative! I can’t stop looking at these photos, I especially love the flower heart with the peppers. It’s definitely a very creative event! And they change it up every year.